The Resident Evil series has a history of do-overs. There are, at a conservative estimate, at least four different scrapped versions of Resi 4. But that wasn’t the first time Capcom canned a game in the series. The very first sequel was cancelled as it approached release due to internal dissatisfaction at the studio. Despite being nearly complete it was all but abandoned, with the team starting over and salvaging just a few scraps of the original idea. This canned version became known as Resident Evil 1.5 to fans and would have been a significantly different game from the 2 we know and love today. This lost Resident Evil 1.5 shouldn’t be confused with another Biohazard 1.5 (to give it its Japanese title), a prequel spin-off that earned its name due to it being set between 1 and 2. That went on to become Resident Evil 3: Nemesis when Sony announced the PlayStation 2. With the next generation on the way, Capcom rescheduled its slate and promoted the 1.5 spin off to become a full instalment on PS1, while what was due to be No 3 moved over to the then next-gen systems, eventually appearing on GameCube and PS2 as Resi 4. This 1.5, however, remains unreleased and as such was never canon, focusing on a story where Umbrella was closed down following the mansion incident in the first game. 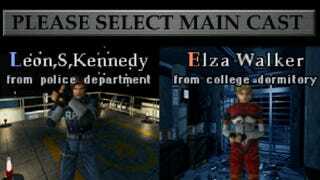 It still featured recognisable elements from the final sequel: a zombie outbreak in Raccoon City, Leon S. Kennedy as a rookie cop, Sherry and William ‘bad guy monster’ Birkin. But instead of Claire Redfield there was Elza Walker, a motorcycle racing university student; it featured mutant baboons, spider-human hybrids and a boss called Golgotha that according to developer notes on concept art had the face of Wesker on its tail. No one knows why. While you could argue that the decision to abandon the original sequel has proved itself over time, for some, the allure of what could have been remains strong. 1.5 wasn’t a secret: Capcom showed it publicly in press and at events during the entire run up to its eventual cancellation. It’s rumoured the game was as much as 80 per cent complete when it was scrapped. That’s led to partial builds of the game leaking out and, in the case of Team IGAS, a concerted effort by fans to rebuild the original. I spoke to two of the approximately 15-strong team to find out more about the what and the why of digging up a dead sequel, and bringing it back to life. As an amateur group of developers bound together by a love of Resident Evil, job titles aren’t strictly enforced (or real names for that matter). “Supervisor or something like ... producer,” guesses B. Zork, the man originally behind the project and currently a team leader of sorts. According to him the core purpose of the attempt to remake the game is to “realise the idea of a Resident Evil 2 that would’ve continued with the game’s initial design direction, utilising as much of its original and authentic content as possible”. So before the team could start rebuilding the game, they had to reconstruct the original engine and the tools needed to manipulate it. “There’s a build of Biohazard 2 that’s been floating around since the late ‘90s pirate disc market. That build has snips of uncompiled code on it,” offers Zork as an example of one of the resources used to help get the raw material of 1.5 in shape. Currently the team is using “a mix of proprietary tools developed specifically for the project, emulators and some other bits ‘n’ bobs of software and hardware,” says Zork. “Basically, if there’s no tool that does what you need a tool to do, you must make it yourself.” For example three tools created by Birkin to help the process along were an extractor to get the code out of the original source files, nicknamed birkOUT, a rebuilder to package it all back into a usable format, nicknamed birkIN, and a room editor called RDT Walker (shown below). There’s also what the team refer to as “behind the scenes official support”, although Zork won’t go any further than that, simply saying that “this person would rather not be involved, but let’s say he was a member of an important software house”. The source has apparently been helpful in explaining why some things were broken or unfinished in the game’s code. Interestingly, one of the first thing this digital archaeology turned up was the clear learning curve the original Capcom development team went through on the journey from Resident Evil 1, 1.5 and 2. Birkin describes 1.5 as “a transition game.” The first instalment was coded “with a funky standard,” he explains, adding “you’d be surprised to see how many resources RE1 wastes because Capcom didn’t approach it with a good strategy.” Number 2 however was more “streamlined and better organised.” While 1.5 is in the middle, neither overly messy, or too polished. For example, some critical code is poorly optimised (Birkin describes core code as “part of the engine that can stress performance to the point lag happens”). Although, despite its roughness, 1.5’s engine had some advantages, with a far greater on-screen enemy count than would finally appearer in Resi 2. As well as the extracted text and clues buried in the game’s code, the games prominent press coverage at the time is an invaluable source of info. There were numerous previews, screens and even a playable demo released to the public. Another shot comparing previously released shots and the restored location. Fan discussion over the layout of the less well-known areas has created a conspiracy-level web of scribbled over screens – looped details linking one area to another. Something that’s been made even harder by the various configuration of the builds that have leaked. There are different locations, or camera angles, or untextured, tricky to identify backgrounds hidden in the data. “Can someone tell me what/where the hell this is? I found it on the Trial Disc,” exclaims one poster in exasperation. Images like the one below, trying to piece together old screens aren’t uncommon. While there are threads poring over gameplay and screens trying to piece together in-game puzzles and the order characters find certain items. Where the team have been filling blanks they at least have a recognisable structure to fall back on: “In the RE games, you have this little egg hunt going. You run to room A to get an item that lets you enter room B, once you’re in room B, you find new things blocking your way, so you need to find new key items, etc,” explains Zork. “I think the part where we might be taking the most liberties [is] with the boss AIs. We don’t know exactly what the boss would have done, but RE2 is probably a good indicator of that. The only thing we can’t nail entirely is the dialogue. We know the intentions of characters, we know where key events will take place, etc.” Using what information they have, the team plan to fill in the 5-10 per cent that’s missing. Making decisions on how to replace missing parts can occasionally ruffle fans, partly because there are plenty of opinions as to what the ‘true’ Resi 1.5 should be. To some, it is the released Resident Evil 2, with 1.5 simply one of the stepping stones along the way. To others, the fragmented bits of 1.5 that exist represent a lost chapter in the story. There are people who want to see it restored and those that see additive efforts to ‘finish’ the game as tampering with the original vision. In the end Zork is relaxed but clear about the accuracy of the eventual result: “We just gotta compare things up against any retail counterparts and try to just do something that both feels contextually appropriate and also fun.” This is, after all, both a huge task but also a fan project powered by the love of a game, and a curiosity for what could have been. It’s a fascinating look into an attempt to preserve an all too fragile digital history that can be rendered meaningless, and then lost, simply because data can’t be read any more. Many old games or important prototypes have disappeared simply because software houses didn’t value the raw materials at the time (more on that here). It’s a small step but efforts like this are saving gaming’s past.